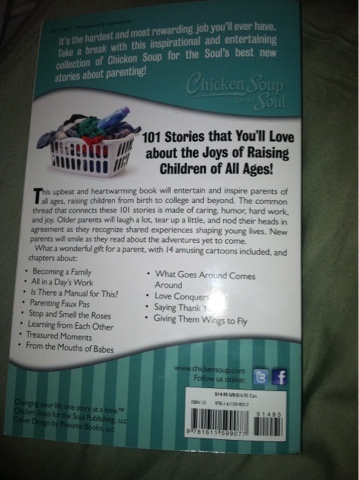 Do you have a wife, mom, or grandmother who loves to read. 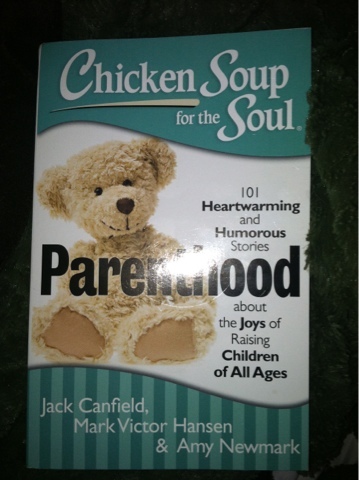 I loved reviewing this new Chicken Soup for the Soul (new to me) book because it took such a comical (but heart warming) look at parenthood. The book includes several short stories, which are perfect for someone who constantly has their attention taken to another place (like my 3 kids). When I have only 5-10 minutes to read, this book is the perfect item to pick up and enjoy for just a short while. It also has the cutest cartoons in it that made me laugh and smile! My favorite story was 10 Precious Minutes. My daughter Chloe is a real diva/princess. She thinks that she deserves to be waited on, hand and foot somedays. We don't treat her this way, but she is always demanding things, even though she knows that she's been doing this for a few months now, and we don't give in to her demands. They haven't said anything funny, really. When my daughter was asked to define the word "flags," she wrote that they marked where all of the whores are instead of the correct spelling wars. My daughter hates to wear dresses. I had one on her the other day when it was hot out. Of course she was being whiny about it. She purposely picked a booger and wiped it on her dress saying "oops, I can't wear it now, it's dirty". She took off the white dress and threw it in the hamper. I was so embarrassed one time while in kmart with my young son. A larger man went to sit at one of the cafe's chairs and my son yelled out that man is too fat for that chair!I was mortified! I tried to explain why that was not polite but he was really too young to understand. one of her 1st words: pizza! I find it hilarious when my daughter runs up to her Daddy and farts on him. She definitely gets them from the both of us. I know most people think "Eww" but in our household it's a natural part of life and we are ok with it. Just not at the dinner table. My son Nicholas was out of cheerios on his tray. I told my son Mark to give him some, He hoarded all of his cheerios and put them in his mouth. These are 20 month old twins. When our son was about 3, he called my pair of white hand barbells " muscle bones" . My daughter calls English muffins American muffins. My daughter can be a little "spacey"....and even laughs about it. We were all talking about something in the living room....and Abbie states an idea. We all looked at each other and laughed. We told her that we thought of that...she said, "I wasn't thinking....I was just being me." She didn't mean it that she's dumb....it just came out really funny! We were at a flea market and my oldest daughter was looking at Music Albums, So my 13 yr old daughter comes up and says they are really big Disc's. We starting laughing and I told my 13 yr. that's right you would not know what they are. Also said to her when I was little my Mom had 8 track told her never mind not even going to explain that one.